With the imminent arrival of Internet Explorer 7 this month, there are many, businesses in particular, who would prefer to stick with IE 6 and block automatic installation of IE 7 via Windows Update. Or you may want to wait a bit to see if there are any hidden bugs in IE 7. 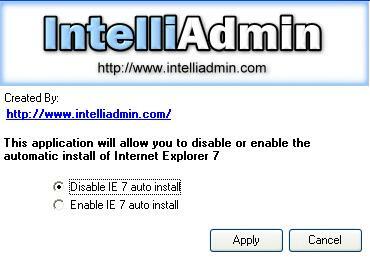 You can perform a registry hack or even download Microsoft's own blocking tool, but IntelliAdmin has released two tools that make disabling automatic installation a lot easier.